Everyday is a Manowar day. Sometimes I'm just smart enough to realize it. I'm the same way but the song from her that I've heard only was the close my eyes forever duet with Ozzy. I haven't touched a full album of hers though. She's not bad. Like a not-as-fun-but-still-pretty-fun, eighties metal version of the Runaways. That sat somewhere between hilariously cheesy and adorable. Still, I can see them being really good musicians, someday. Anyway, I've decided to go on a James Blake binge. I'm at the end of Enough Thunder. Next album: the eponymous James Blake. Last edited by Blarobbarg; 04-22-2013 at 02:29 PM. He's better than me and you. His self-titled had a handful of songs that I liked, but I considered the majority of it filler. Overgrown blows it away in every aspect, IMO. 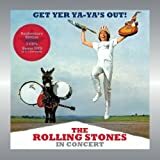 Listening to the first of 2 bonus discs with the Expanded Edition of Get Yer Ya-Ya's Out. I'm having trouble getting their LP Crazy Master but I'd love to hear it though. Is this your first time giving James Blake a listen? Every once in a blue moon I get the urge to listen to old metal bands who only ever released demos. Slaughter Lord were a pretty keen. Nothing but In Bloom is in my head (my free radio plays whatever, lol). Last night it was some late 80s female singer (I can't remember) and I didn't like it. It had the same style and sound as Self Control by Laura Branigan, except wilder, something like from Heart but only one artist; not two. Not as well known as Total Eclipse of the Heart, but similar style. She's blonde as I recall. See, it's just like a radio in that way. Anyway I wanted to analyze In Bloom which I think is comedic, especially in the way it starts out like it started in the middle of nowhere like a clumsy entrance or unwelcome stumble of someone with a low self esteem but it's not sad. He is hilarious. Then the guitar melody that graduates downward ominously seems to be making fun of humdrum, bored and pessimistic human condition or himself. I don't like the song THAT much just wanted to talk about it.